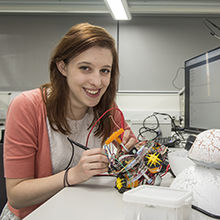 Our MEng Electronic Engineering degree will develop the knowledge to engineer the electronic signals critical to the world around us. This four-year course will equip you with a wide range of skills at the leading edge of technology, highly sought after by employers in electronics and information engineering. Electronics and electronic systems have become the enabling technology of the material world. Develop the skills and knowledge to engineer the electronic signals that pervade the world around us. This programme is also offered with a year in industry. What is this? (More Information)This information is based on historical data and may have been aggregated. It is also subject to theUniversity's disclaimer notice. Our distinctive MEng Electronic Engineering will build upon the BEng Electronic Engineering programme and give you a more advanced understanding of the management skills needed to become a leader in the electronics industry. It will also take you to the leading edge of technology sought by industry and equip you with the wide range of skills required for a career in electronics and information engineering. In your fourth year, you will be challenged to either solve real problems for a real industry customer or to transfer technology from the University into industrial practice. Our MEng Electronic Engineering will provide you with the skills to work in any area of the electronics industry. We have excellent relationships with employers, and have our own Careers Hub website. We also run an annual careers fair. 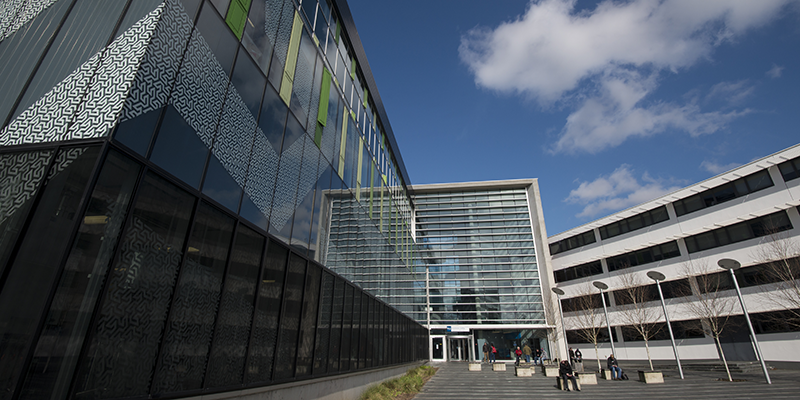 Students undertake four years of study. Each year there are compulsory modules. However, the degree has been designed to maximise student choice by allowing you to tailor the degree structure to suit your own interests. Specialist options in the last two years of the degree will take you to the leading edge of technology sought by industry. There is an opportunity to study abroad for a semester. This programme can also be offered with a year in industry. All undergraduate applications for Electronics and Computer Science should be made online through the Universities and Colleges Admissions Service (UCAS). Find out how to apply and get further details about UCAS' website, phone and contact details. "The world class facilities, combined with lecturers whose industry background gives them a unique perspective on how to apply taught knowledge in the real world, sets up graduates for the most demanding of jobs"
"The workload of my course is challenging but rewarding. We covered so much material in the first year - I am amazed when I look back and reflect on how much I have accomplished!" Dave Al-Khalili graduated with an MEng in Electronic Engineering. Here he talks about being an Electronics and Computer Science student, his experience at the University of Southampton and his future career plans and ambitions. A*AA including Mathematics and Physics. Physics may be substituted by Further Mathematics, Computer Science, or Electronics. General Studies and Critical Thinking are not accepted as one of the three A levels. If English is not your first language, you will be required to pass an approved English test. We normally ask for a score of IELTS 6.5 with at least 5.5 in each competency. For information on other accepted English language tests, please visit www.southampton.ac.uk/admissions_language. We welcome applications from candidates offering qualifications other than A and AS levels (including BTEC Higher National Diploma, European Baccalaureate, International Baccalaureate, Irish Leaving Certificate and Scottish Highers). You will be expected to attain an equivalent standard (or higher) to an A level applicant. If you want to study for a degree in Engineering, Physics, Mathematics, or Geophysics but you did not choose mathematics and physics at A level, our Foundation Year may be of interest to you. The Engineering/Physics/Maths/Geophysics Foundation Year is a one-year full-time course integrated with a further three or four-year degree course. Find out more about the Foundation Year. We welcome applications from international students. For information on applying, visit the International Office website. We welcome applications from mature students. If you will be over 21 at the start of your proposed degree programme, you may be eligible for exemption from our normal entry requirements. However, you will be required to provide evidence of having completed recent study (eg Access, Return to Study, Open University foundation courses) and of your capacity to pursue the course. In this year, you will select four Optional modules. In this year, you will select five Optional modules. Employability is embedded into modules from the first year onwards and right from the first lecture. We explain the degree skills which are being taught throughout the modules and offer a number of optional employability modules. The technical skills you will obtain are in high demand, as are skills of understanding and analysing problems, together with communicating the results. We have excellent relationships with employers and our own ECS Careers Hub offers a valuable resource. 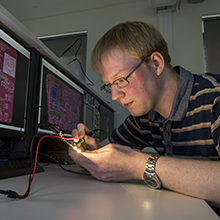 Adam Malpass, an MEng graduate of Electronic Engineering, was UK Electronics Skills Foundation Scholar of the Year 2011.“The ECS careers fairs offer many opportunities for employment and placements,” he said.“Being in ECS really does open doors for you”. Dave Al-Khalili graduated with an MEng in Electronic Engineering. In this film, he talks about support and facilities at ECS as well as the challenging Group Design project. Students undertaking this programme with a Year in Industry will spend 100% of their year in industry on placement study, and the year will be assessed by 20% practical exam assessment and 80% coursework assessment. Course fees for 2017/18 full-time UK and EU undergraduate students are typically £9,250 per year. Tuition fees for international students differ between each course. Most part-time courses cost 50% of the full-time fee.